None of them live in caves, but they are all members of the Troglodytidae, the family of songbirds also known as the wrens. 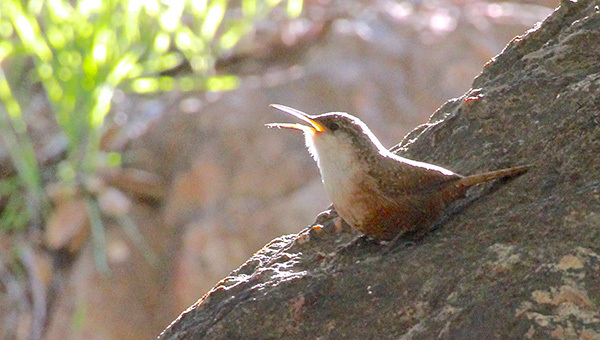 The family name comes from Greek for “cave dweller.” Like hermits in a cave, wrens typically nest in an enclosed area. Five species of wrens are seen regularly in Mission Trails Regional Park (MTRP), in the right habitat. The wren species most commonly seen in MTRP are Bewick’s wren and house wren. 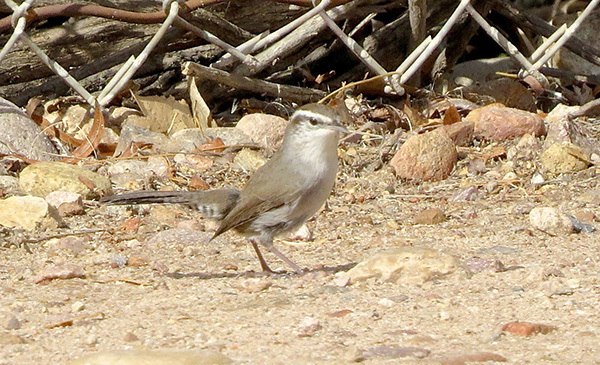 Bewick’s wren has a white eyebrow contrasting with its chocolate-brown head, which distinguishes it from the drabber house wren. Bewick’s wrens prefer chaparral and coastal sage scrub habitats. If there are no trees available for a cavity nest, they will use a hole in the ground or rock crevices (so maybe some of our wrens do live in a cave!). John J. Audubon named this wren after his friend Thomas Bewick, an engraver known for his 19th-century illustrations of British birds. Bewick never traveled to our continent, so he never saw this North American bird in the wild. House wrens prefer oak or riparian woodlands. They do not excavate their own cavities, but will use holes made by woodpeckers. They are feisty little birds, known for evicting other birds and taking over their nests. In addition to cavities in trees, house wrens frequently use the nest boxes placed in MTRP. Marsh wrens like marshes. 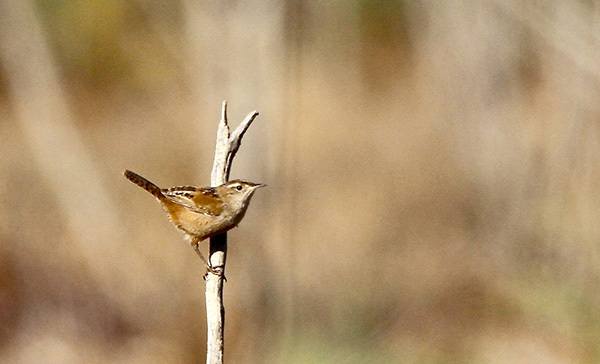 Sometimes heard vocalizing in the reeds at Lake Murray and Kumeyaay Lake, the marsh wren, if you are lucky enough to see one, is a little more brightly colored than either Bewick’s or house wrens. It has black and white stripes on its back, set off by a rich reddish-brown. Like Bewick’s, it has a white eyebrow, but it also has a dark cap on its head. Marsh wrens tend to stay well hidden in marsh vegetation. They build a woven nest attached to reeds. Rock wrens like rocks. They are seldom seen in other habitats, but anywhere there are rock formations, you may see a rock wren. They are paler than the other wrens, with a light beige belly. Unlike our other wrens, its tail is not usually cocked up, but is held in line with the body. 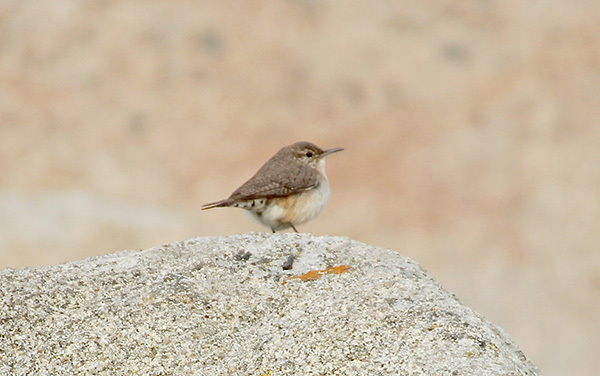 A characteristic pose is a rock wren standing on a rock doing what looks like little knee bends. 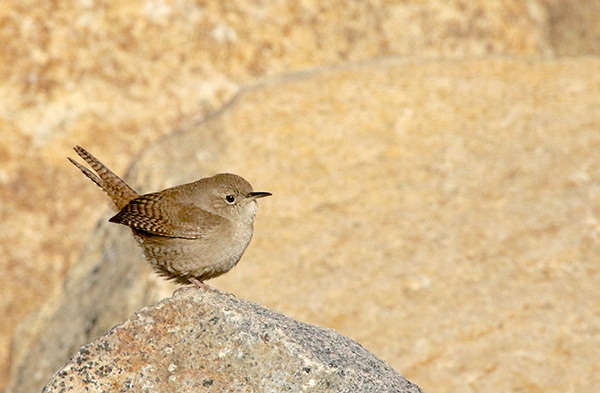 Rock wrens tend to nest in rock crevices or rodent burrows, often placing small pebbles near the entrance. You may be wondering why I have not mentioned the wrentit, an emblematic bird of Mission Trails and chaparral habitats. The wrentit is not a wren and wrens are not even its closest relatives. The wrens in MTRP may be lumped into that generic description of “little brown jobs” (LBJs for short). But if you take a closer look, you will find that each of the wrens has its own special charm and you will come to know and love the hermits of Mission Trails. — Millie Basden is a trail guide at Mission Trails Regional Park. Kids Nature Story & Craft with a Ranger: 10 a.m., every third Saturday – meet at KLC Campground Kumeyaay Lake Picnic Structure, RSVP to 619-668-3279. *Partial listing of monthly events at Mission Trails Park. Please view website for full calendar of free activities, programs, and updates at mtrp.org or call the Visitor Center at 619-668-3281.